LAHORE – Pakistan’s Habib Bank Limited has decided to close its operations in New York after a US financial department, Department of Financial Services, served a notice on it seeking to impose a penalty of millions of dollars. 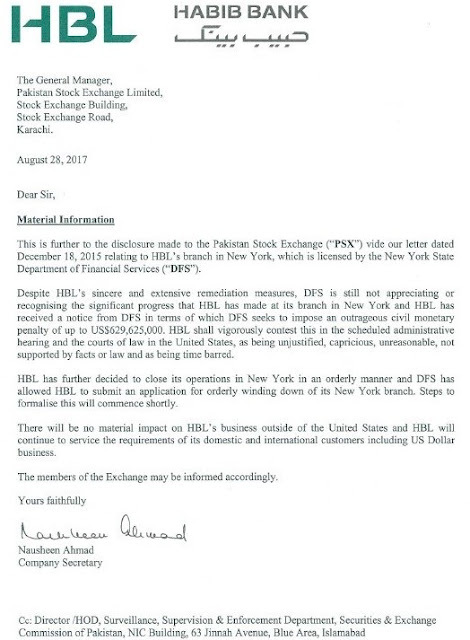 According to filing of HBL to Pakistan Stock Exchange available with Daily Pakistan, “Despite HBL’s sincere and extensive remediation measures, DFS is still not appreciating or recognising the significant progress that HBL has made its branch in New York and HBL has received a notice from DFS in terms of which DFS seeks to impose an outrageous civil monetary penalty of up to US$629,625,000”. 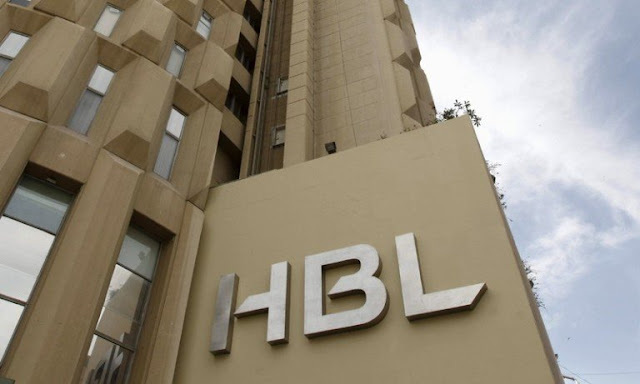 “HBL has further decided to close its operations in New York in an orderly manner and DFS has allowed HBL to submit an application for orderly winding down of its New York branch. Steps to formlise this will commence shortly,” read the letter. HBL shall vigorously contest this in the scheduled administrative hearing and the courts of law in the United States as being unjustified capricious, unreasonable not supported by facts or law and as being time barred. The letter, written on August 28, was copied to the director of Surveillance, Supervision & Enforcement Department of Securities & Exchange Commission of Pakistan. It further states the penalty notice will not impose impact on bank’s business outsides of the US. Earlier in 2015, the only US branch of Pakistan’s largest bank Habib Bank Limited (HBL) had been slapped a strict enforcement order by United States Federal Reserve after significant breakdowns were identified in the Branch’s anti-money-laundering program which was found to be not in compliance with US federal laws. According to the Wall Street Journal, following the enforcement order Habib Bank has been stopped from opening new dollar-clearing accounts, which are one of the US services to send and receive dollars from abroad, or even correspondent accounts with foreign banks. Under the 14-page order which was issued after a thorough examination by the New York State Department of Financial Services and Federal Reserve Bank of New York, the bank has also been restricted from increasing the amount of dollar-clearing transaction from the branch til the issue is resolved. The branch will require a special permission from NYSDFD for increasing the number of dollar-clearing transactions. Extending his hope that problem will be fixed as soon as possible Manochere Alamgir, who is currently functioning as General Manager in HBL New York Branch, said that they have hired a new compliance staff and a third-party consultant to resolve the matter as per asked by the Federal Reserve authorities. HBL takes any instructions from regulators very seriously and we intend that everything will be fixed according to rules, he added. The report also suggested that action was taken against HBL after it failed to fix the issues despite initial warning of the Federal Reserve and New York State Department officials. 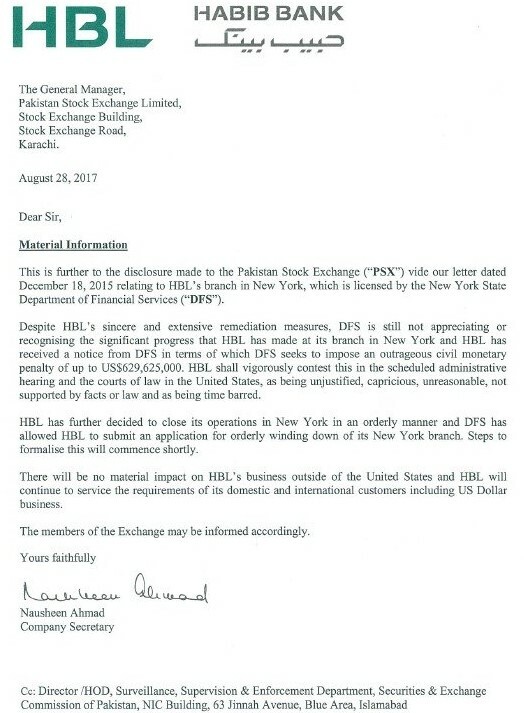 0 Response to "Habib Bank to close New York operations as US department seeks $630 mln penalty"